Antediluvian Vol. 2 is Dope Folks Records' third release to feature the talents of Kevroc and X-Ray Da Mindbenda, following Antediluvian Vol. 1 and the Legion of D.U.M.E. '94 D.U.M.E. EP, both of which are all sold out. Limited to just 300 copies, this one is likely to do the same, so get yours now while you still can. All six songs on here, four of which are from '96 and two of which are from '93, can be streamed below via Dope Folks' YouTube channel. 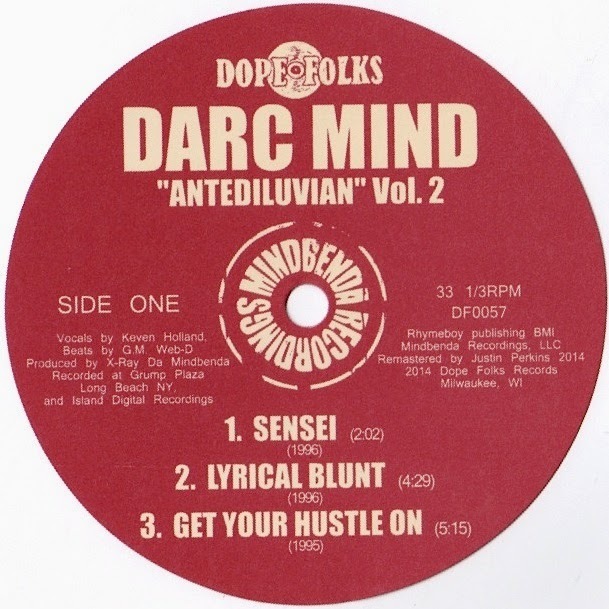 Respect due to Darc Mind for archiving all this material and allowing it to see the light of day decades later, to Justin Perkins for remastering it, and to Dope Folks Records for continuing to put out previously unreleased hip-hop of the highest caliber.